I thought you might enjoy this recent article, which details the founding of one of our sister schools in Hillsdale College’s Barney Charter School Initiative (BCSI). We are one of 16 Hillsdale schools bringing classical education and civic virtue to students in public education across the country, and this article does an excellent job explaining why Hillsdale College is interested in improving K-12 education and what all of the BCSI schools have in common. Sound familiar? Reading about Seven Oaks reminded me of the earliest days of our school, and that first work day when some of our families turned up to cut the grass, wash the windows, and pick up garbage on the field. Those were hard days–but also wonderful days, as we got to know each other doing the hard work that wasn’t going to get finished unless we all stepped up to take care of it. Starting a school is a beautiful thing, and although we have moved very quickly past those difficult early days, it’s still the independent spirit and the get-down-to-business attitude of our teachers, our staff, and our parent volunteers that keeps this place going. Last week as the Fall Festival was concluding I looked at the cafeteria and thought to myself, “How are we going to get this place cleaned up?” Then I got into a conversation with a parent new to our school, and when I turned around again about 10 minutes later the tables had been bleached, the floor was swept, all of the decorations were in storage, and a group of students had taken it upon themselves to fill up buckets and find mops so that they didn’t leave a sticky mess on the floor for Rodrigo, our janitor, to clean up the following morning. Two years ago, that might not have happened. Our students are learning to take the initiative and be responsible for making good things happen, even when that means mopping the floors of the cafeteria at 10pm. 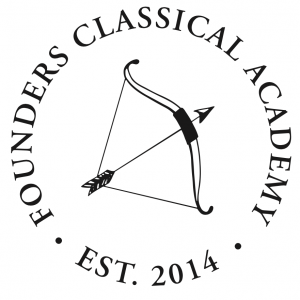 That pioneer spirit that brought our school into being is still alive and well at Founders, and the good example of our parents and staff is being noticed and emulated by our students. I encourage you to read the whole article, and remember that we are part of a small but influential movement across the country. Your support of classical education and your hard work on behalf of our students is making a difference, little by little.